Family car winner | What Car? 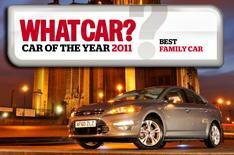 The Ford Mondeo is unequivocally the finest family car ever made, because its hard to fault in any area. For a start, its a rewarding car to drive, thanks to the feel and weighting of all its controls. Its also as comfortable and as assured on a quick dash down a twisting country road as it is spending all day ploughing up and down the motorway. Go for our favourite 138bhp 2.0-litre TDCi model and youll have a smooth, muscular engine thatll pull like a train from tickover. Slot it into sixth gear as you zip down the slip road, pop on the cruise control, snuggle your shoulders back into the supportive drivers seat and youll soon feel like youre running on autopilot. The Mondeos cabin is so spacious and smartly trimmed, you may well find yourself in high demand with your business buddies whenever they need transportation to their next meeting. Its perhaps just as well that the Mondeo is so comfortable because its 70-litre fuel tank and 53.2mpg average mean its theoretically possible to travel 800 miles between fill-ups. Granted, a Volkswagen Passat will have less of an impact on your pocket, thanks to its lower company car taxation group. However, if driving is a crucial part of your daily business, wed go for the Mondeo, because the polished driving experience will deliver you wherever you need to be feeling fresher than you would in any rival. As is befitting of a mile-munching motor, the Mondeo comes with bags of safety features, such as full electronic stability control and seven airbags, including one to protect the drivers knees. Our favourite Zetec model also features dual-zone air-conditioning, cruise control, electric drivers seat-height adjustment, powered front windows, a heated windscreen and a CD player with MP3 connectivity. It also has that essential business tool Bluetooth phone connectivity. So what are you waiting for? There may be a great deal of choice in the family car class, but to our minds theres only one outstanding contender: the Mondeo is in a class of its own.